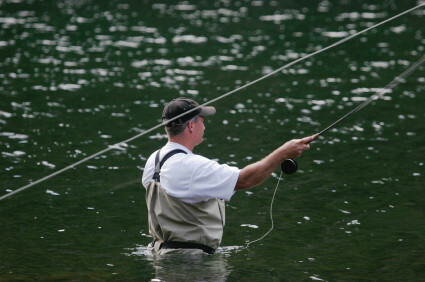 Fly fishers spend a lot of time on the water, but more often, in the water. Waders are an essential piece of equipment to make a long day on the water more about the fish and less about how to stay dry. Different companies use a multitude of techniques and materials to try and accomplish keeping dry and staying warm, but after all is said and done fly fishing waders can be separated into three main groups: nylon, neoprene, and breathable styles. Nylon Waders - Most fly fishing beginners choose nylon waders simply due to the reason that they are considerably cheaper than the other styles. One step ahead of the pioneer rubber waders that fishing started out with, nylon is much lighter than its rubber counterpart while still keeping you warm and dry. Nylon waders are good choice if you are a beginner angler who is still learning and does not plan on spending too much time out on the water. Neoprene Waders - These are usually thought of as being in the middle class of fly fishing waders available to anglers. Due to the unique material used in these waders construction, neoprene waders are excellent in battling even the coldest of weather and conditions. Another key feature of neoprene waders is that you can buy them in a wide assortment of thicknesses to tailor them to the specific conditions that you plan on fishing in. 3mm neoprene waders are used for fishing summer conditions while the 5mm and 7mm wader varieties are better suited for winter conditions. Neoprene waders are a good choice for expert or beginner anglers alike. Neoprene is a very good insulating fabric for cold weather conditions while the thinner varieties can be worn comfortably in the long summer months. Moreover the price range of neoprene waders is quite cheap making them a wise choice for the conscientious angler. Breathable Waders - These fly fishing waders are relatively new to the fly fishing world and have the advantage of using new materials such as Gore-Tex to help keep anglers dry and very comfortable. Above all else Gore-Tex waders are the best of the breathable style of waders. Gore-Tex allows the body to breathe naturally and for body heat and sweat to escape resulting in less build up of condensation, which keeps you drier and happy for hours on end. As far as durability goes, usually breathable waders are covered with a type of tear/snag resistant material. For any serious fly fisherman breathable waders are really the only choice. Although they are pricier than the other fly fishing waders, they are good in a wide range of environmental conditions, extremely comfortable and probably the most durable type of waders available on the market.